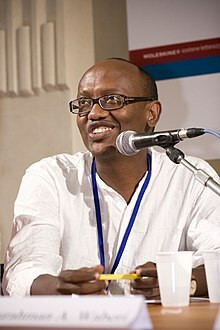 Abdourahman A. Waberi is an award winning poet, novelist, essayist, academic and short-story writer, born in Djibouti in 1965. His first volume of stories, Le Pays sans ombre received the Grand prix de la Nouvelle francophone and the Prix Albert Bernard. His books translated into English are Land Without Shadows (2005), In The United States of Africa (2009) and Passage of Tears (2011). He lives with his family in Caen, Normandy, where he works as an English teacher. The African Book Review is posting a poem from each of Africa’s 55 countries over the next few weeks. Poem suggestions can be sent through the comments form below. ‘Like’ us on Facebook, Twitter, and Tumblr to read all the poems. Enter your email address to follow us.